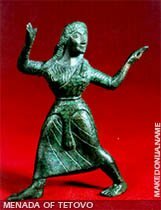 Macedonia is a treasury of cultural wealth. The Slavonic alphabet was born in Macedonia, where the Macedonian educators Saints Cyril & Methodius, and Saint Clement and Naum played an important part in the spread of Christianity. Macedonian builders and mosaic masters shone like a bright star in the dark period of European culture prior to the Renaissance. 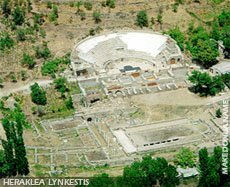 Scholars and writers often refer to Macedonia as a magical country for archaeology - there are many historical sites, including those at Stobi by Gradsko, Heraklea Lynkestis by Bitola, Lychnidos by Ohrid and Scupi by Skopje. In the site of Viničko Kale (near Vinica), the discovery of terracotta icons aroused great interest among historians and archaeologists. The Basilica Mosaic in Heraklea Lynkestis is one of the most famous mosaics of antiquity. 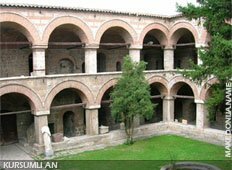 There are many remains from Roman times and the early Christian period. Macedonian cities have an imposing number of churches. The famous architects and fresco-painters worked on numerous churches, and in Ohrid alone their number exceeds 30. Lake of Ohrid and the town of Ohrid are under the protection of UNESCO. Several churches, the most renowned among which is St. Pantelejmon, bear witness to the times of the educator St. Clement. The churches and other cultural monuments built between the 11th and 12th centuries are characterized by unique architecture and priceless frescoes and icons, famous throughout the world. Ohrid was the cradle of Slavonic literacy, which the brothers Cyril and Methodius and later their students spread to other Slav peoples starting from the 9th century. 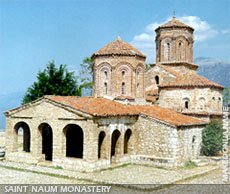 One of the best known historical monuments is the Church of St. Sophia, the former Cathedral of the Archbishopric of Ohrid. It was built in the 10th and 11th centuries. Invaluable frescoes from the 11th and 14th centuries have been uncovered. From the Turkish period, there are monuments of Islamic culture such as mosques, bazaars and baths. In the 14th century, Skopje was described as being an important trading center with its Old Bazaar, Covered Marketplace (Bezisten), the Kursumli An Caravanserai, Daut Pasha Baths and the Mustapha Pasha Mosque. 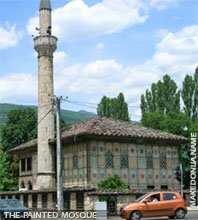 Another important monument of Islamic culture in Macedonia is the Painted Mosque in Tetovo. A large number of monuments have been erected following the liberation. One of the most interesting is the monument devoted to the Ilinden Uprising in Kruševo. Many memorials have also been built, such as those in Prilep, Kumanovo, Veles and Štip, renowned for their beauty and expressiveness. 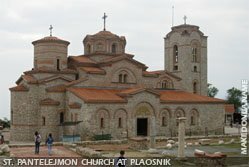 In 1990, work on the cathedral of St. Clement of Ohrid in Skopje was completed. 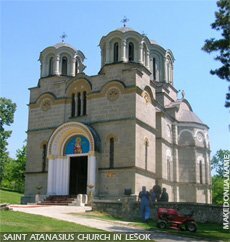 Macedonian construction companies built this church according to the best national traditions and Macedonian painters painted its frescoes and icons which remain as a legacy for the future.